Jump start your career search today! ICYMI: Michigan celebrated National Apprenticeship Week November 13-17. Check out all of the activities. Stay up to date on the latest veteran news, career opportunities and more! Learn more. When he first came to Grayling Michigan Works! for career assistance, Dan Howlett had years of experience as a cook and was employed in a career he wasn't happy with. Dan was looking for a career change, hoping to find a lifelong career that would offer potential advancement opportunities, something he could potentially retire from. 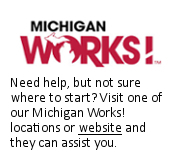 With WIOA funding, Michigan Works! helped Dan obtain on-the-job training at Springs Window Fashions as an Assembler/Operator. Michigan Works! also provided support services to help Dan purchase steel-toed boots, which were required by his new position, as well as mileage reimbursement during his training. On Tuesday, November 14, 20 senior high school students from Byron Center, South Christian and Thornapple Kellogg schools in West Michigan participated in an information session and tour of a construction site with Buist Electrical. West Michigan Works! provided information on apprenticeships and the students were able to see firsthand what it’s like to work in the construction trades. Oakland County Michigan Works!, always looking for innovative ways to communicate with employers and job seekers alike, hosted a special Twitter Chat with businesses, education professionals and organizations interested in sharing information about apprenticeships on Wednesday, November 15, in conjunction with National Apprenticeship Week.